safety kit like Tower, Cleaning, building maintenance and construction kit. 1. 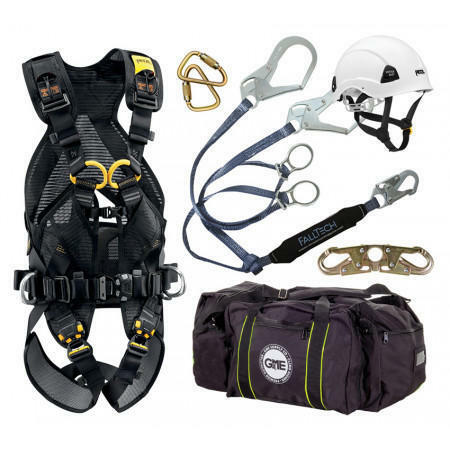 OS 556 Multi Purpose Harness with 5 attachment points. 2. OS FA3 Rope Grab Fall Arrester to be attached to the anchorage Line to provide a continuous point of contact between the user and the anchor line. The Rope Grab ensures smooth travel either way, locking instantly during sudden downward movement (i.e. worker slipping). Conforms to EN353-2 3. OS Double Stop Descender. 4. OS RAL1 14mm Polyamide Rope Anchorage Line 50 Mts. or as per requirement, includes a Karabiner for attaching to the anchor point. Confirms to EN 354, 362 5. OS R1 Polyamide Rope Roll 50 Mts. 6. OS711 3 Karabiners for connection. 7. OS WS4 Pass through Anchor slings 8. CO TB1 Tool Bag 9. OS B1 Back Pack Carry Bag. OMKAR SAF ETYCONSTRUCTION WORKERS KIT is designed for work on elevated platforms or for general construction sites and maintenance work where not much movement is required. This kit comes with 1. OS 556 Multi Purpose Harness 2. OS FA3 Rope Grab Fall Arrester to be attached to the anchorage Line to provide a continuous point of contact between the user and the anchor line. The Rope Grab ensures smooth travel either way, instantly during sudden downward movement (i.e. worker slipping). Conforms to EN353-2 3. OS DWL1 Double Webbing Lanyard with Scaffold Hooks, Shock Absorber and Karabiner 4. OS RAL1 14mm Polyamide Rope Anchorage Line 100 Mts. 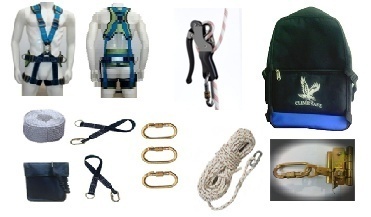 or as per requirement, includes a Karabiner for attaching to the anchor point. Confirms to EN 354, 362 5. OS TB1 Tool Bag 6. OS B1 Climb Safe Back Pack Bag.